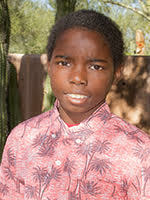 Tyris is a 13 year old boy that is usually seen playing football, basketball or swimming. Tyris is a very active kid who enjoys always being on the move. He also has a creative side and enjoys drawing, arts and crafts, and building things. One thing you can always find Tyris doing is dancing! He has been practicing new moves and loves to show them off. One of his biggest dreams is to be a famous basketball player and would love to meet Stephen Curry one day. Tyris is going into the 7th grade and has an IEP in place. Tyris likes school and his favorite subject is science. The best fit family for Tyris would be a one or two parent home. He would do best as the only child or with younger children. Tyris will need a family that is patient and consistent with boundaries and consequences. He will need a dedicated family that is willing to take the time to build a strong and loving bond.o give. For more information about Tyris, please contact Kayla Huner-Waymire at (602) 930-4628 or via e-mail at khuner-waymire@aask-az.org.